I have a new favorite healthy recipe. Perfect for the holidays, too! 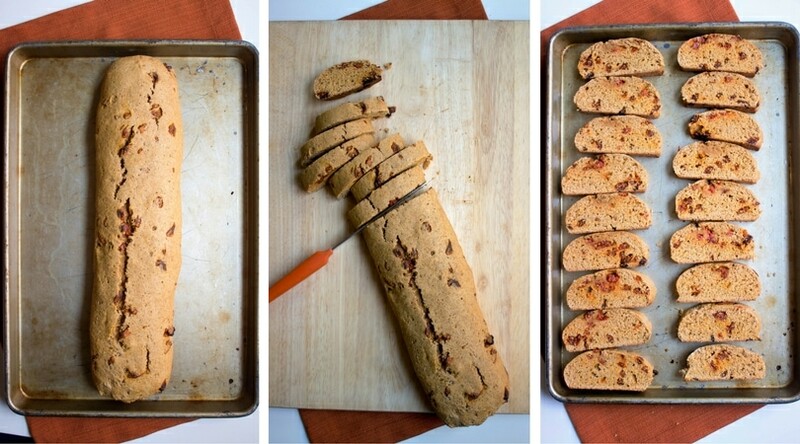 Introducing: Whole Wheat Pumpkin Goji Biscotti! I’d forgotten how awesome biscotti is until I made this a couple weeks ago, just for fun. 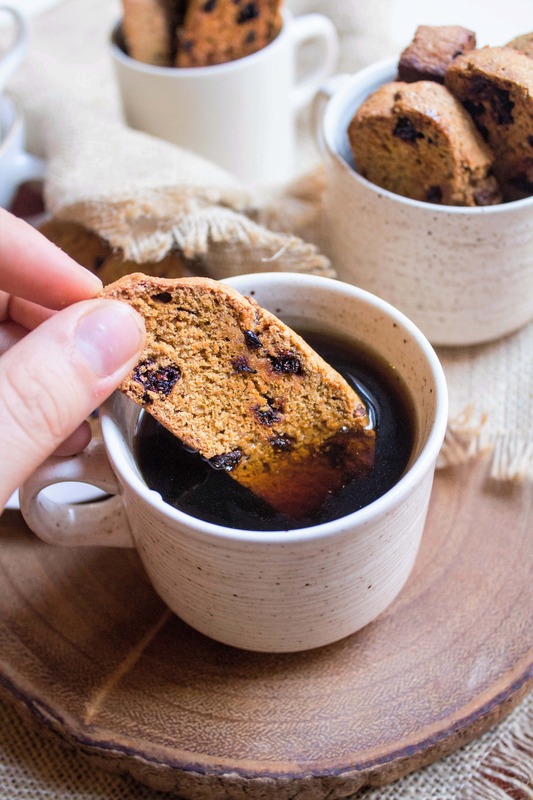 Lattes and hot tea are just that much better when biscotti is by their side, don’t you think? 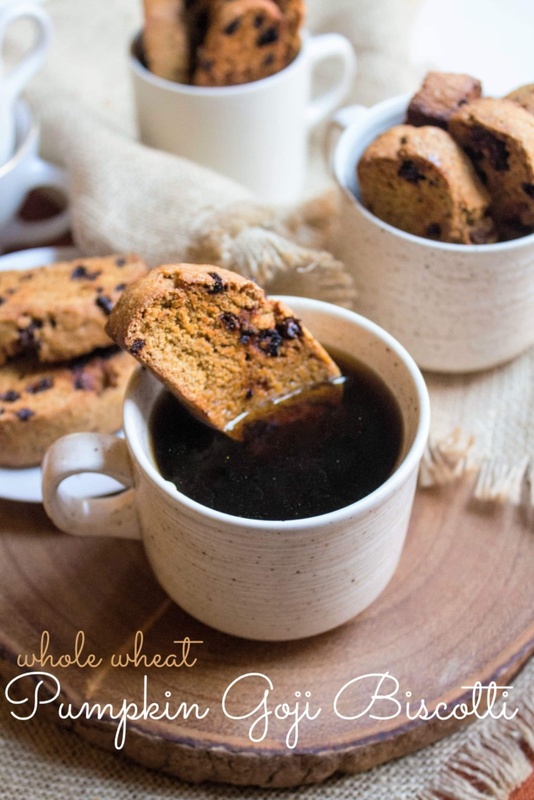 Even better is that this biscotti, while delicious, is also whole wheat, lower in sugar than normal biscotti, and packed with some great nutrients from the pumpkin and dried goji berries! Goji berries are full of antioxidants – perfect for cold season. And pumpkin is always a win, let’s be honest. In a large bowl, mix dry ingredients. 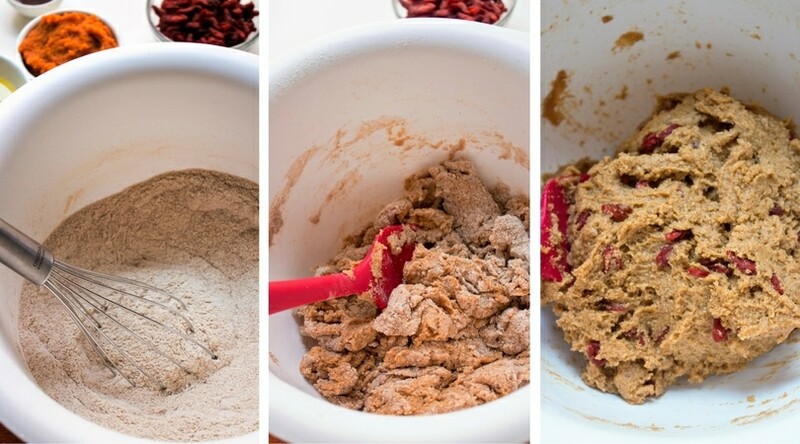 In a separate bowl, whisk together all wet ingredients except for the goji berries. Add wet ingredients to dry, mixing until uniform. Add goji berries and gently mix. Coat a baking sheet with cooking spray; form dough into a loaf shape and place on sheet. Bake until center is firm (about 20 to 25 minutes); remove from oven and cool. Reduce oven temperature to 300 degrees. Once cool, slice into 1-inch thick cookies; bake 15 to 20 additional minutes at 300 degrees. These would make a great holiday gift, don’t you think? 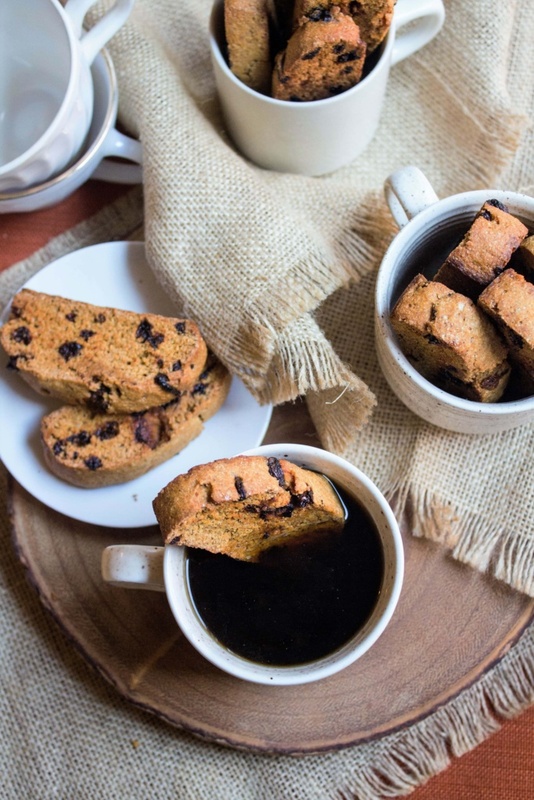 What’s your favorite flavor of biscotti? Yum! I love almond biscotti the best. Love this recipe, but I would leave out the goji berries. I know they are good for you, but I just CANNOT do goji berries. These look amazing! I can’t wait to try making them myself. I love all kinds of biscotti, but I think my favorite in gingerbread biscotti. I am SUPER pumped to try these!! Biscotti’s are my favorite thing to make at the holidays!! I love Biscotti’s, but haven’t had one in forever. Can’t wait to give this recipe a try! This looks delicious! I would love one with a big mug of coffee right now! This looks amazing!!! 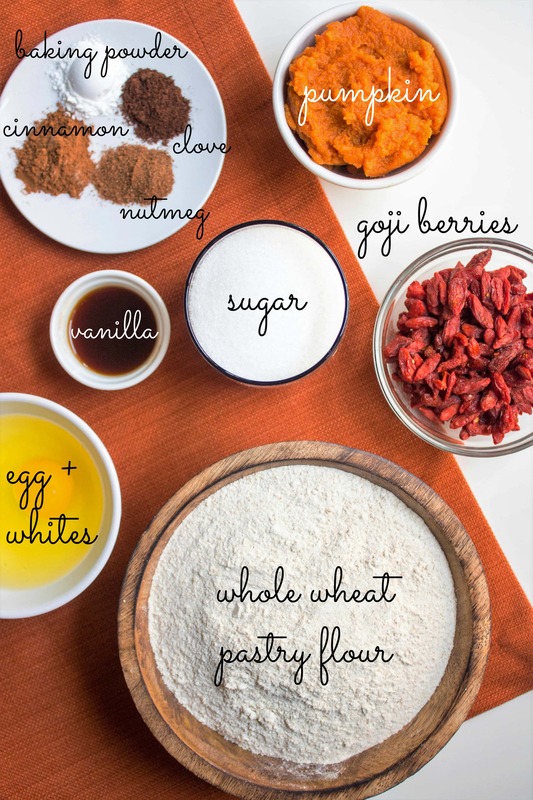 Love how few ingredients there are, wonder would it work with flax eggs! I don’t think I’ve ever had a goji berry but these look really good. Is it just me does the biscotti look green in some pictures? They’re red in person. :) The baking turned them a deep red, normally they are bright. These look fantastic and would make perfect homemade Christmas gifts! This looks great, do you think I could substitute chocolate chips or nuts for the goji berries? Maybe – give it a try! Small pieces would work best. They look great! 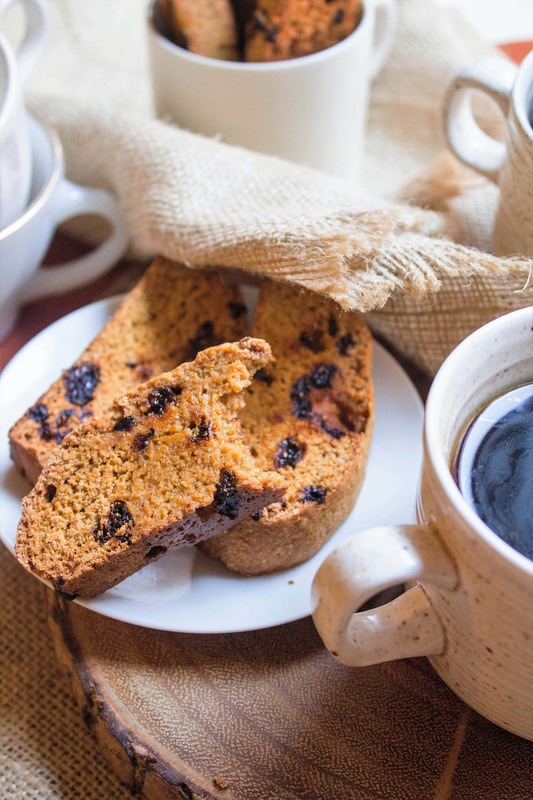 I love making almond raisin or coconut biscotti; they are so good with espresso! I’ve only had the usual kind… is it almond? A co-worker makes his and it is delicious with coffee. That is the best way to have it, i think. Chocolate my favorite! Thanks for sharing the recipe! Love biscotti and excited to have a new recipe in time for the holidays. 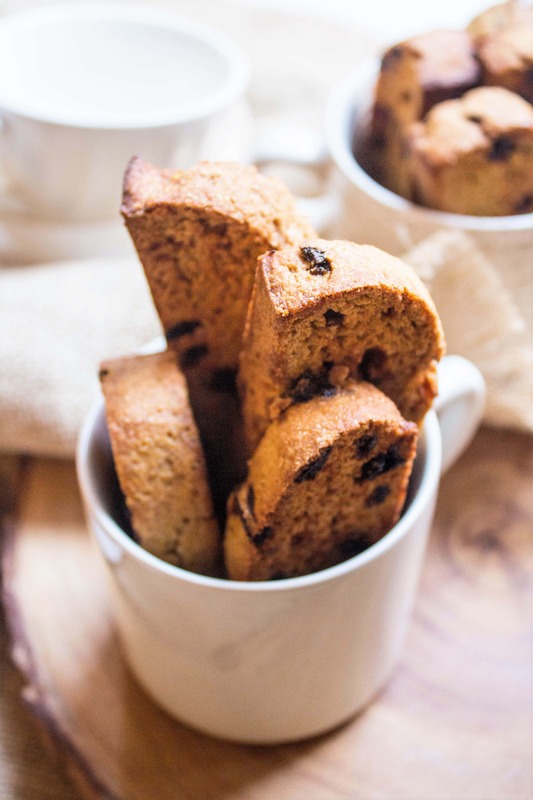 My fav is a made-up power biscotti loaded with oatmeal, nuts, seeds and dried fruit. these are literally in the oven right now. I’ve never made biscotti and have been afraid of it. here’s hoping! And love the antioxidant packed goodness -looks delish! Made them tonight and enjoyed with some mint tea. So yummy! Thanks for the recipe. Yay – glad you liked them! Love the food styling on these photos!! 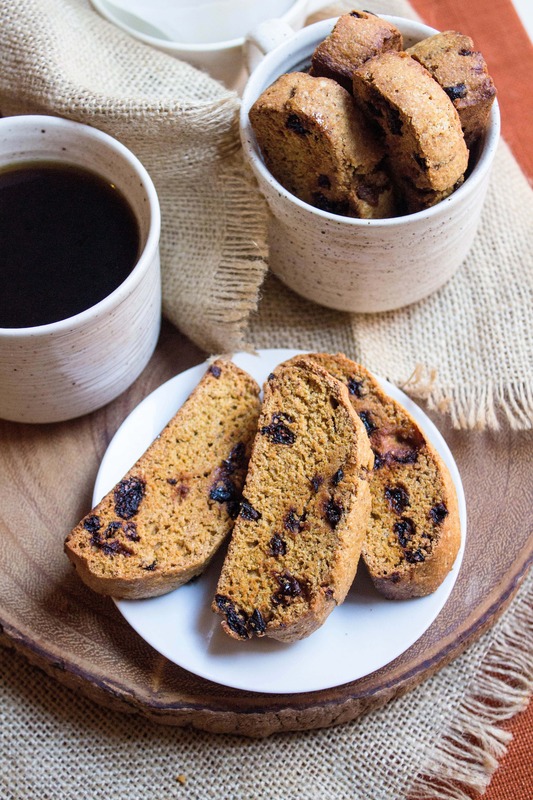 I’ve been craving biscotti and these healthy pumpkin biscotti look too delicious to pass up! Thanks so much—hope to try them soon. These are delicious, but I need to cook them longer next time. Mine aren’t crunchy. I used your shorter cook times. The smell when they were cooking was wonderful. It might be too watery, but you could try it! Let me know if it works! just made these for my dads birthday! added some almonds to half for him, no sugar for me, they taste great! !